where $m$ is a surface dipole moment and $z_m$ is the thickness of the box in the $Z$ direction. The correction introduces a jump in electrostatic potential which should of course be placed within the vacuum region of the supercell. Create a working directory tutorial-dc and move inside it. The file VCL3D.xml contains all information necessary for the visualization of the electrostatic potential. For the two-dimensional slab, it is always a good idea to visualize the plane-averaged electrostatic potential along the vertical ($Z$) direction. 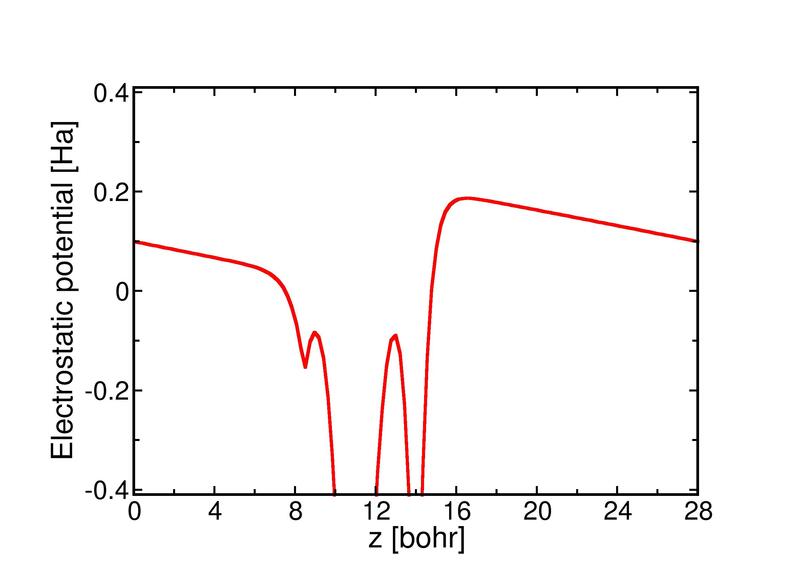 From this figure, you can see that the electrostatic potential within the vacuum layer is not flat, and the vacuum energy level cannot be identified. In principle, the true electrostatic potential of a two-dimensional slab, which contains dipole in the vertical direction, will be flat within the vacuum layer but has a jump. However, owing to the periodic boundary condition applied in the "supercell approach", the electrostatic potential should be continuous at the boundary of the supercell, which makes the electrostatic potential at the right side decrease, and that at the left side increase, in order to maintain the continuity. By applying the dipole correction, the electrostatic potential will be flat, and the potential jump will be recovered, as presented in the next section. Let us go back to the parent directory tutorial-dc, create a new one named dft-dc, and then move inside it. Then, copy the files input.xml and STATE.OUT, which are found in the directory where you last performed the calculation, to the actual directory. Change the attribute do = "fromscratch" to do = "fromfile". It means that we will use the pre-converged STATE.OUT file from the previous calculation. In some cases, this will improve convergence in self-consistent iterations after the corrected potential has been added on the electrostatic potential. Add the attribute dipoleposition = "0.9". The value of the attribute dipoleposition indicates the position of the jump in electrostatic potential, after the compensating potential (i.e., the dipole correction) is applied. The value of "0.9" here is a fractional coordinate in the vertical direction. Please note that this jump position should be located within the vacuum region enough far away from the atomic layers, otherwise the compensating potential cannot be correctly applied. It is recommended to put the jump position at the middle of the vacuum layer. From this figure, you can see that the electrostatic potential has been corrected. It is flat on both sides, and has a jump in the vacuum layer. The platform in the vacuum layer refers to the vacuum energy level. By comparing the vacuum energy level with the corresponding energy of the valence band maximum (VBM) and conduction band minimum (CBM), you can calculate the ionization energy (IE) and electron affinity (EA), accordingly. Please note that here, due to the existence of a dipole, two platforms appear in the plane-averaged electrostatic potential. It means that we have two vacuum energy levels (one on the left side and the other on the right side), and therefore two IE and EA values, for the HCCF system.